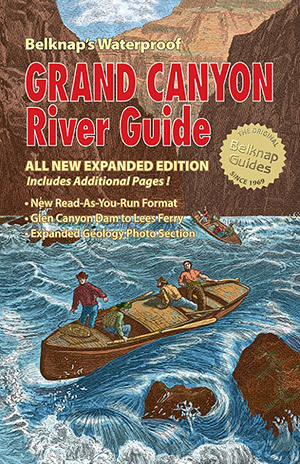 2017 Update of Belknap’s Waterproof Grand Canyon River Guide is NOW AVAILABLE. The ALL NEW Expanded Edition features 8 additional pages and includes Glen Canyon Dam to Lake Mead, new Read-as-you-Run format, and photo geology labeling from Lees Ferry to Lake Mead. 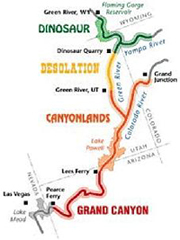 The first Powell Centennial Grand Canyon River Guide was published in 1969, followed by waterproof map guides covering the entire Green and Colorado River system. Our Waterproof River Guides include Canyonlands River Guide, Dinosaur River Guide and Desolation River Guide. The four Guides have been companions to hundreds of thousands of river running adventurers through the years. Annually updated with new information and photos, today’s full color editions feature shaded relief maps, accurate river mileage, campsites, GPS waypoints and informative text by noted archeologists, botanists and other Canyon experts. Get a Westwater Books River Guide for your next trip or to help you remember your last one.